The 3 player version is really fun and very simple. Build decks and gruff-teams as normal. Players sit across from each other and arrange their goats in a line in front of themselves (First player arranges his gruffs first, then the 2nd player, then the 3rd). If done correctly the play-space will look like a triangle. 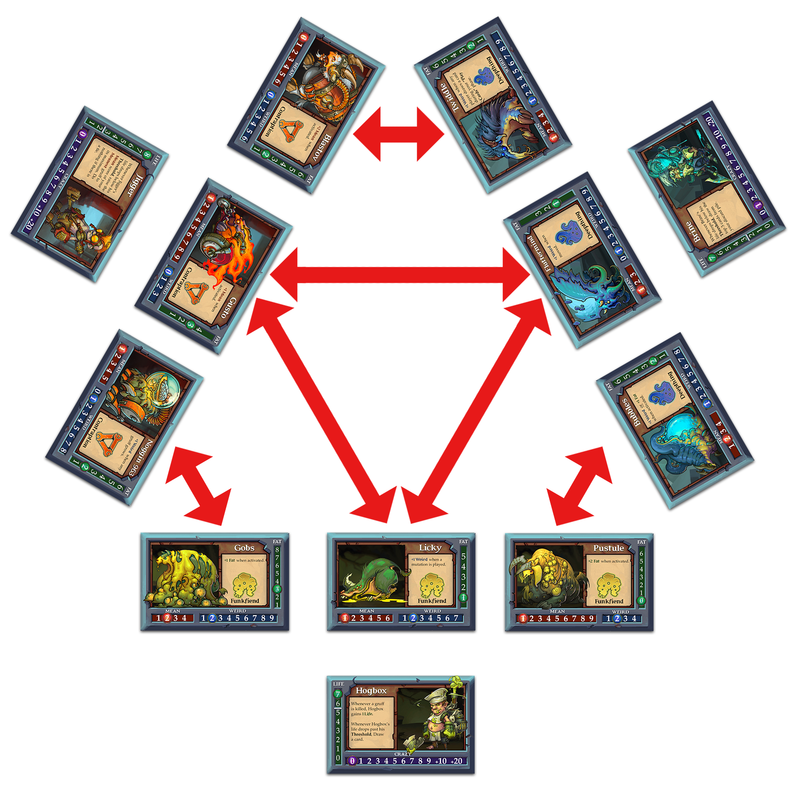 Play proceeds normally except gruffs on corners of the triangle are only allowed to attack the enemy gruff that is closest to them, while the gruffs in the middle may choose either middle position to attack. For 2v2 gruff each pair of players brings a single shepherd. Each player brings 2 gruffs with 10 cards a piece (So each side will have 4 gruffs). 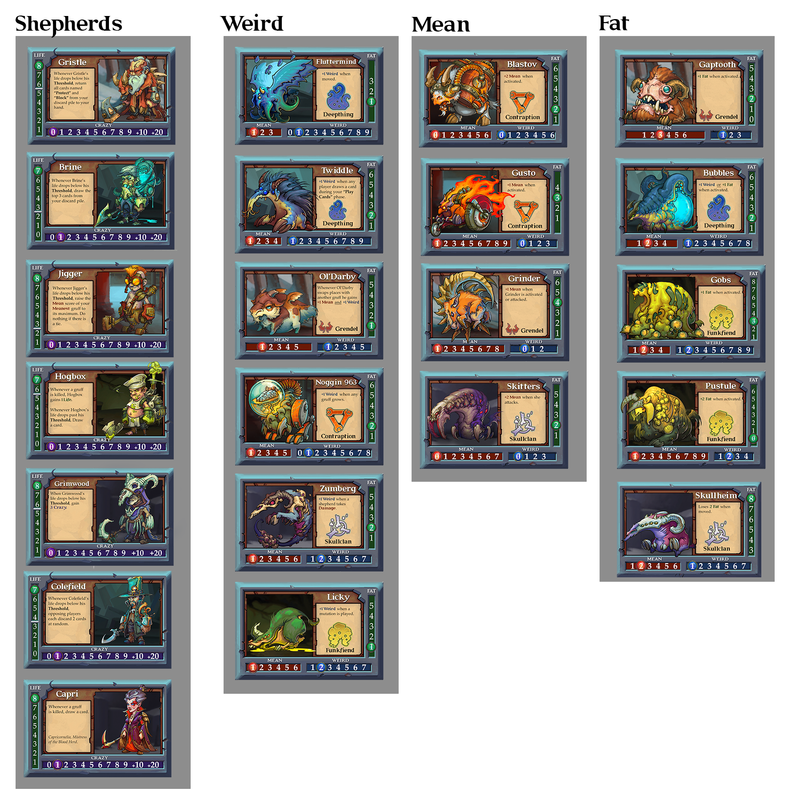 Each player will have a deck of 20 cards and will be in charge of their own 2 goats. Each team alternates turns, but players will take a turn when their team decides that it is the right time to activate a gruff that they own. 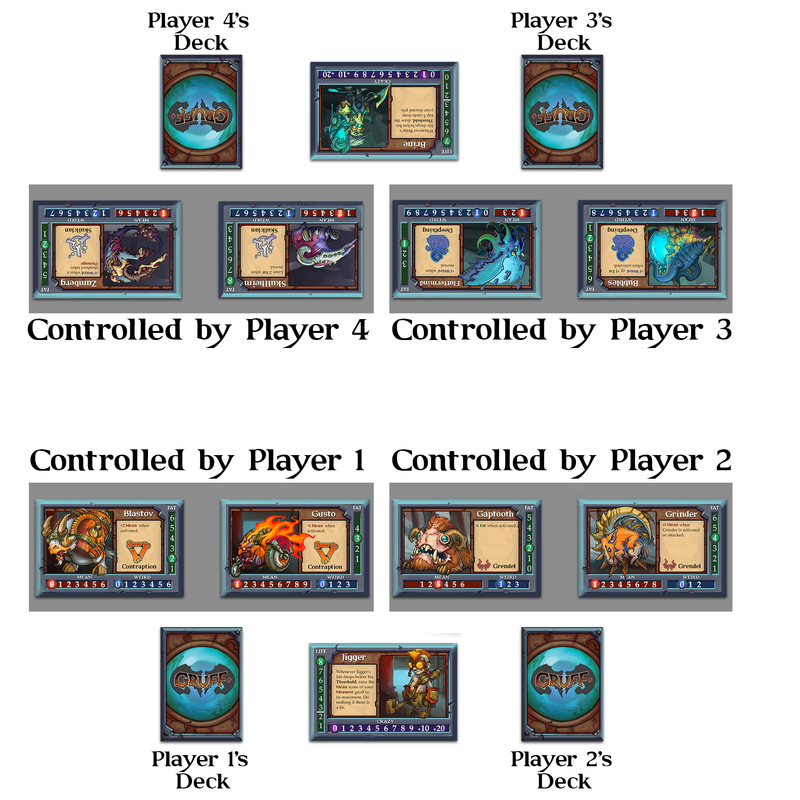 Gruffs on the same side may swap places with each other, even if they are being controlled by different players. Otherwise the game plays as normal. This mode is a great way to experience draft without the worry about having a player make an non-functional deck. First you lay out all goats and shepherds on the table. Group all of the shepherds together, then create the following groups. The first player chooses a shepherd, then each other player chooses a shepherd. After the 4th player chooses a Shepherd, he may immediately choose a goat from the Weird group. Pick order is reversed, each player chooses a Weird gruff. After the first player has chosen a Weird goat he immediately chooses a mean goat. Players 2-4 then choose Mean goats. After Player 4 has chosen a Mean goat he immediately chooses a Fat goat. Players 3-1 then choose Fat goats. Players choose 8 cards per drafted goat ( like normal). Players 1 and 4 play against each other, while players 2 and 3 play against each other. After those matches the winners play against each other and the losers play against each other to determine ranking.